Propperiet is one of the 3 restuarants next to each other on the harbour. Its focus is mainly on fish and meat. It is open for dinner every day, but on weekends it is also open for lunch with a fish buffet. We decided to try the buffet out this past weekend, and what a difference from the last buffet we reviewed! Both service and the food quality get a big thumbs up here! We were greeted with a smile and shown to our table as we arrived. We could then help ourselves to the buffet, with drinks brought to the table. The buffet is set up along a long table. As the restaurant is quite small everyone is seated quite close but not on top of each other. The website says that there will be at least 20 options at the buffet, and I would say that that was easily present on the day we went. Amongst what I remember off the top of my head there were green mussels to 3 types of salmon, stuffed squid (my favourite) to vitello tonnato. For 19 DKK you can also get a shot of schnapps (3 varieties on offer). We were very impressed with the presentation, variety and quality of the food. If I had to have one criticism it would be that the items on the top level are not made for short people like me! I couldn’t see inside to see what was in them. But then, at 160 cm not many Danes are my height! At least everything was well labelled so I could ‘see’ what was inside. Sonderborg buffets have been redeemed! Definitely one to return to. 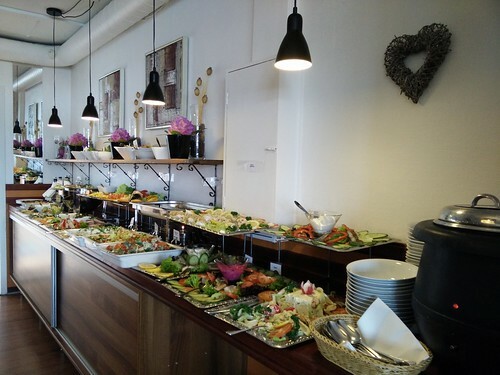 This entry was posted in Restaurants and cafes and tagged buffet, Danish food, dinning out, fish, food, Propperiet, restaurant by Ann. Bookmark the permalink.